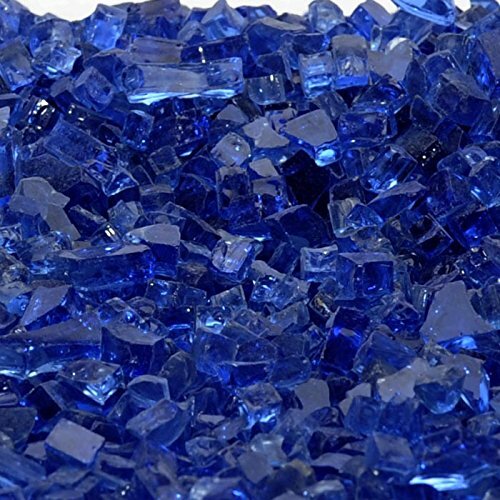 Blowout Overstock Fire Glass 1/4" Diamond Blue Fireplace Fire Pit Glass 10 Pound Bag | Fountain City Art Ctr. This is our Diamond Blue Fireglass. The Fire Glass is approximately 1/4" in size. WE ARE WAY OVERSTOCKED ON THIS COLOR!!! This is the lowest price you will find on high quality fireglass crystals. The quantity is for 10 pounds of glass. If you need 50 pounds, order quantity of 5, if you need 100 pounds, order quantity of 10. 8 pounds covers approx 1 sq. ft. 1 inch deep. Great for Fire Pits and Fireplaces or Fountains or any Water Feature.